In a continuation of yesterday's post, here is the noodle recipe I promised. 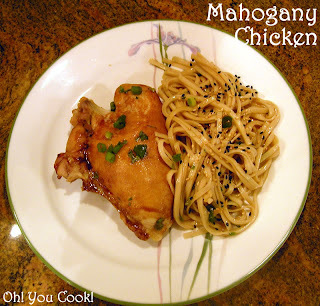 This one is a slight adaption of a recipe from Simply Reem, to use ingredients I had on hand. 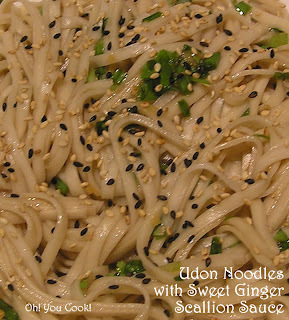 Udon are flat wheat noodles, about the width of linguini pasta and shorter in length. It cooks up quicker (in about 5 minutes) and softer than linguini, so be careful not to overcook. If you are the kind who thinks mild taco sauce burns your throat, then literally use only 2 drops Sriracha for the entire recipe (for flavor), otherwise use up to as much as 1/2 teaspoon. I used 4 drops, but youngerSon mixed in at least an entire teaspoon to each of his servings. He would have had a third helping, but I needed something to cart to work the next day. Enjoy. I'm heading out to see Le Miz. It is traditional in Jewish households to celebrate December 25 with Chinese food, followed by a movie. Or the other way around. In an attempt to perpetuate this stereotype, the theme for this month's Kosher Connection is Chinese food. As part of the rules, we can repost a previously posted recipe, so I'm recycling the basting sauce used for Mahogany Wings and slathering it on other chicken parts as well. Unless you have a silicone baking mat, line your baking pan with foil. Use foil, even if you have a non-stick pan, because the sauce has a tendency to chemically bond with your pan. Chinese Hoisin sauce is a condiment whose ingredients vary wildly across manufacturers. Since the brand I use proclaims as part of its name to be vegetarian, I hate to assume what might be in other brand who don't sport a kosher hechsher (certification). The noodles alongside the chicken are Udon Noodles with Sweet Ginger Scallion Sauce. See you at thegoogolplex Tuesday.